Today was resupply day. The first 40 days or so through the south island are through some fairly remote areas with 7 or 8 days between small settlements, with the settlements themselves not really having much in the way of shops to resupply from. Sure you could do it but the range of food choices would be small and the price tags rather large. So most Te Araroa trampers put together food boxes to send ahead to themselves to pick up on the way through town. The alternative is to hitch out upto 50km or more to larger towns as you pass over thestate highways. My goal for the day? Buy up big. Hit the shops for around 30 days worth of food (one 8 day section I’ll get sorted out next week), assemble food drops and get them posted. Lake Coleridge Lodge in Lake Coleridge to cover 6-7 days worth. In addition I had my bounce box to pick up and send on to Tekapo; and a gear box from home to swap out bits and pieces of gear like changing my sleeping bag to a warmer one and mail back home. This was going to be quite the mission, back and forth to the post office as there was no way I could carry all the different parcels in one go. I’d also have to get food organised for the 1st leg of the south island along the Queen Charlotte Track. Warning to any trampers completing the south island and getting ready for the south. Be prepared for a huge slug to your budget. With accommodation costs, food, postage to the south, the Interislander crossing, water taxi to the start of the QCT and permit for the QCT expect your hip pocket to be quite a bit lighter. Thanks great for all the ultralighters out there right? Turns out shopping for 30 days is quite hard. Trying to keep track of what you’ve put in the trundler, making sure there is variety and that making sure you have enough is difficult. I’m sure it will all work out ok and I’m guaranteed to have bought too much. A few spare meals wont hurt just in case the is a day or two bunkered down in the mountains. As it turned out I’ll have to make a second trip to the supermarket to fill in the gaps. Spreading all the food out looked crazy. Never have I ever bought so many snacks at one time. 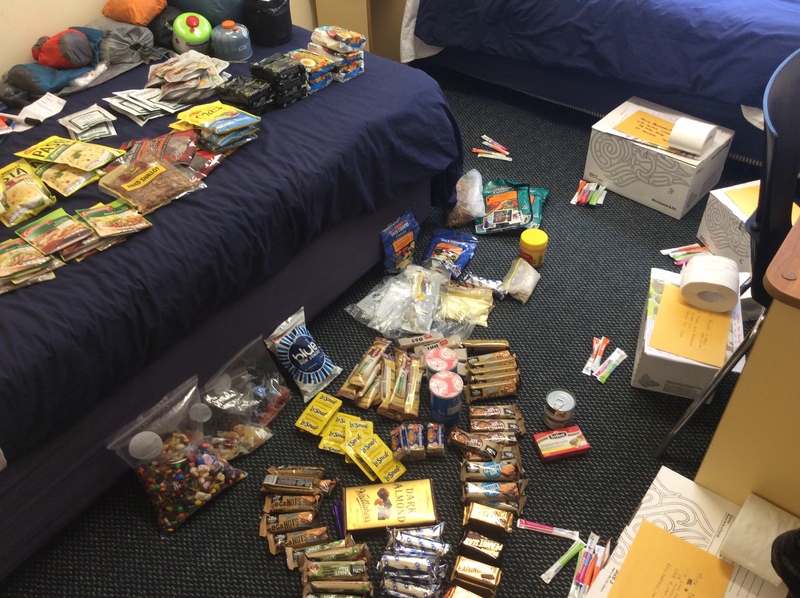 Snacks included: Oreo biscuits, museli bars (about 10 packets for 2 a day), chocolate bars, powdered drink flavours as water is boring every day, and pringles for a salt and vinegar hit when you really need it. Plus a massive bag of scroggin full of nuts, pepitas, saltanas, dried tropical fruit like paw paw, mango, coconut, M&M’s; jelly beans and gummy bears – all from the awesome pick n mix rack that can be found in all NZ supermarkets. Breakfast, the most boring of the lot. Ceral with powdered milk and the odd instant porridge to mix it up a bit. Lunches, super straight forward, wraps with either vegemite, peanut butter or nutella. Sending food ahead a month in advance everything needs to keep. I’ll see if I can at least grab some cheese on the way through small settlements. And I almost forgot… toilet paper in each box. Thats it. Resupply day. No time for rest. That is what tomorrow is about.